For months, even years, amateur astronomers, photographers, and anyone wanting the best possible view of today’s solar eclipse have been planning trips into the phenomenon’s path of totality. Now that it’s over, all that’s left are millions of grainy Instagram photos—and a traffic nightmare that traces the same path as the eclipse’s shadow. Twitter’s @dicktoblerone appears to have been the first to spot this fallout, which is clearly visible on Google Maps’ live traffic feature. The country’s most clogged asphalt arteries can currently be found in the Southeast, which would have been the last region to see the total eclipse in the sky. The traffic may have been equally awful in the Northwest a bit earlier, but it appears to have cleared up. 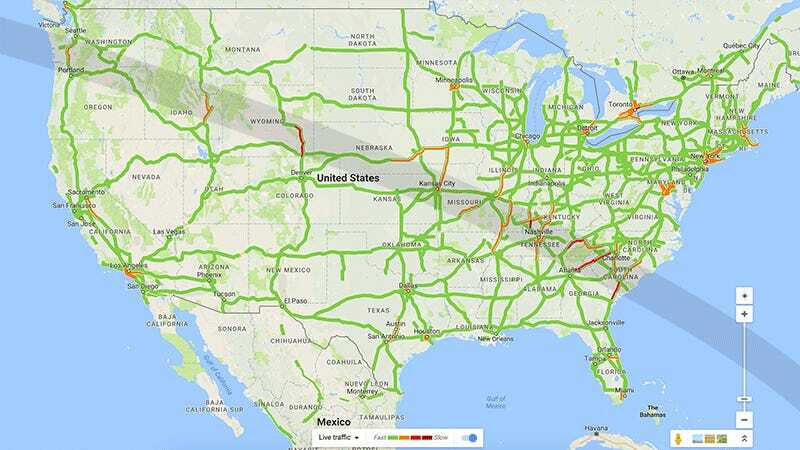 The next time a total solar eclipse will be visible in the United States is on April 8th, 2024, giving you plenty time to find a house somewhere near the shadow’s path, so you won’t have to deal with traffic nightmares like these seven years from now.